Master the art of all things LASHES! Learn FIVE of the most aught our techniques which include Classic, Volume, Bottom extensions +Lash lift & Tint). Classic Lash Extensions are semi-permanent extensions to one natural single eyelash. In AAC’s intense training course, students gain the tools needed for a professional application. Volume Lash Extensions are ultra fine extensions, that are hand created at the time of application by the lash technician. 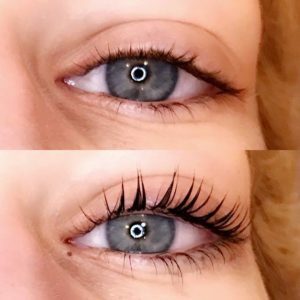 We will teach you how to create eyelash extensions that are then placed onto the natural lash in a fanned effect, to create extra volume, coverage and fullness than cannot be created with classic extensions. Lash Lift is like a perm (but without chemicals like parabens or formaldehyde), for your natural eyelashes. It uplifts and curls them from the base of the lash, making them stand out and look longer. Eyelash tint is done to enhance the defining effect. Bottom Lash Extensions: Bottom lash extensions are applied to the lower lashes to provide a complete glamours look to the eyes. Our instructor will teach you the proper method to safely apply bottom lash extensions on your clients. Course balance is due 2 weeks prior to class start date. It is the student responsibility to provide a model, should there be a challenge contact our admissions department. Most states require either a cosmology and or Esthetician License. Please check your state requirements before registering.